We can learn a lot about presenting survey results by looking at what experts do. 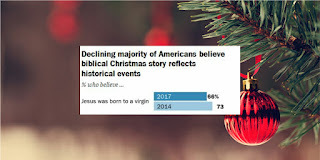 The scientists at Pew Research presented findings from a Christmas in America survey. Take a look at their work. 1. Focus on highlights. For general audiences, select the most important facts. For example, it is no big news to say over 90% of Christian Americans celebrate Christmas. But to learn there’s a drop in celebrating Christmas as a religious rather than a cultural holiday is news (46% down from 51% in 2013). It’s also interesting to learn that younger persons are lower on the religious emphasis than are older adults. Of course, to focus on highlights, you have to create good survey questions in the first place. So, check out the items Pew reports to make their findings more meaningful (e.g., include age groups and religious affiliation in your survey). 2. Use percentages and graphics to depict trends. On fact 2, “Merry Christmas” or “Happy Holidays,” Pew shows a change in the trend for “it doesn’t matter” what people say in stores or businesses. Endorsing the phrase “It doesn’t matter” rose from 45% in 2005 to 52% in 2017. Percentages make sense to most educated readers. Means and standard deviations are not as widely understood. Simple line and bar graphs also help readers avoid losing focus in dense text. Again, see the Pew examples: Christmas in America survey. 3. Pew does a good job of presenting different answers to a complex question about Christian displays (e.g., Nativity scenes) on government property. Some think the displays should never be allowed (26%), others think its fine if there are other symbols (29%), while most think they should be allowed without other symbols (37%). By presenting years 2014 and 2017 on two different lines, we see how the views have changed. In addition, the report uses color to help us compare the different group responses. 4. Present controversial beliefs with enough detail to make it clear who believes what. Pew asked questions about the historicity of the Christmas story events—things like virgin birth and visitors guided by a star. The key words for each item are printed next to the data presented for two recent years (2014 and 2017). We see that belief in the virgin birth dropped from 73 to 66% from 2014 to 2017. You do have to read the text to learn that the findings are different among those in the sample who identify as Christian. For those wanting more detail, Pew includes a link to their “Religion & Public Life” page. If you follow the link, you will see much more detail in the tables. 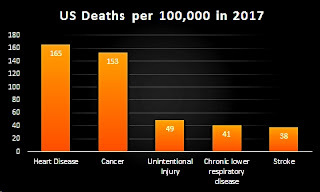 The tables also provide another example of how to present data to a general audience.